I thought, Thanks a lot. You called to tell me I’m repeating myself like a please-continue-to-hold message? Are you trying to cause my self-esteem to nosedive, like the Dow when someone hit the wrong computer key? Then I considered my oeuvre, mainly to see if my so-called friend had a point but partly because I like the word "oeuvre" for its pretentiousness and the fact that it’s French. 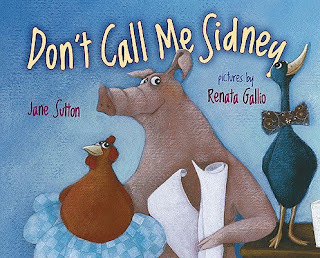 In my newest book, Don’t Call Me Sidney, illustrated by Renata Gallio (Dial, 2010), a pig named Sidney writes a birthday poem for his friend and decides his destiny is to become a poet. When he realizes that the only rhyme for his own name is “kidney,” he changes it to the more rhyme-able “Joe.” His friends dislike the change, and his horrified mother reminds him he was named after his great-great-great grandfather, who invented the mop. At the end of a sleepless night, earnest Sidney comes up with a compromise: he will be known by his rhyme-able, shortened given name—Sid. Oh. I guess my new book is about being yourself. 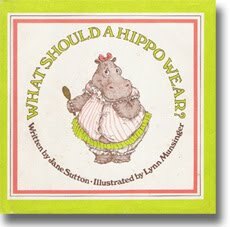 But what about my book, What Should a Hippo Wear? illustrated by Lynn Munsinger (Houghton Mifflin, 1979)? All right, two points for Fay. But I have seven published books. They can’t all say the same thing! Anyway, in the original book, Cindy Krinkle considers herself the only normal person in her embarrassing family. Her father, for example, rides to work on a bike with a built-in umbrella, while singing opera off-key. Cindy’s dictionary-memorizing sister packs her school lunches in the “Use in Case of Air Sickness” bags Mr. Krinkle brings home from his airplane-cleaning job. Cindy’s attempts to unweird her family all backfire, and she eventually realizes her family is pretty great. She accepts them for who they are, and I suppose, by extension…herself. I had to admit it: Fay was right. 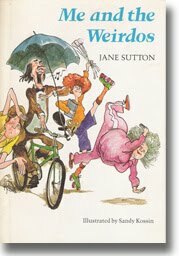 My other titles, ranging from picture books to a YA, with characters from a koala bear to humans, have similar messages. But maybe it’s not so bad that I continually revisit the theme of being true to yourself. With all the forces conspiring against kids being able to do that—peers, TV shows, movies, even their own parents—I think it’s a really important message. Then I remembered the heartening end of my good friend Fay’s comment: "...and no one plays that song better than you."